#100712 - Excellent for Legal Documents and Checks! We offer a unique line of 24 lb. (90g/m) security papers that we can micro-perforate, diecut, score, and punch to your specifications. This security paper offers both covert and overt protection against the threat of forgery and counterfeiting on paper documents. MICR/OCR Laser Security Paper is sensitive to paper altering chemicals including polar and non-polar solvents. These features produce a visible stain or starburst reaction on the paper. When bleach or ink eradicators are applied to the security paper, the colored pattern disappears. This material also contains invisible fluorescent fibers that become visible when viewed under an ultraviolet light source. These fibers do not copy or scan and will not be visible in a counterfeit document. Uses for MICR/OCR Laser Security Paper are wide and varied for those institutions who want to laser print their own checks, forms, legal documents, licenses, coupons, permits, receipts, certificates, tickets and passes on their own security paper. Green - Available in 8.5″ × 11″ sheets with a 10 sheet minimum order. Yellow - Available for Special Order in 8.5″ × 11″ sheets with a 5000 sheet minimum order. Pink - Available for Special Order in 8.5″ × 11″ sheets with a 5000 sheet minimum order. Slate - Available for Special Order in 8.5″ × 11″ sheets with a 5000 sheet minimum order. Tan - Available for Special Order in 8.5″ × 11″ sheets with a 5000 sheet minimum order. Blue - Available for Special Order in 8.5″ × 11″ sheets with a 5000 sheet minimum order. True Blue - Available for Special Order in 8.5″ × 11″ sheets with a 5000 sheet minimum order. Non Basketweave Blue - Available for Special Order in 8.5″ × 11″ sheets with a 5000 sheet minimum order. 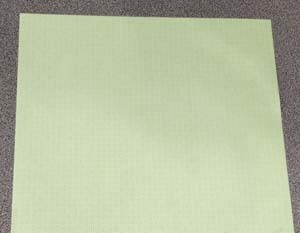 Rippedsheets has taken this Green Colored Basketweave Patterned Security material and added a Permanent Adhesive to create an excellent security label. Archival safe and acid free. Cutting die required. Pick one of our 3,000+ dies free of charge or create a new die. No die required for blanks. Microperfing/scoring diecosts.